I had really mixed feelings about riding this road. Butterflies were roaring in my stomach. The border crossing was one of the fastest ever! I crossed the border on Sunday 31.Jan2016 around 16o'clock. Customs and immigration on the Ecuador side took about 10min. Then I went to take copies of passport and bike papers for the Peru side. Besides that I changed a few dollars in one of the shops so I had some cash if needed. Nobody cared about Peto and a few locals sponsored my journey. Thank you very much! I crossed the bridge, drove under the barrier and parked on the right side. I got the feeling of being in the wrong movie. Chickens with their little ones running all over the place. But no I was at the right place. However there was an electric cut and thus immigration guys did not want to do anything. Then I went to customs because that anyway takes longer. So I filled the papers by hand instead of the guy typing everything into the system and then printing the cards. Now it came REALLY handy that I took some copies on the Ecuador side where they had electricity. 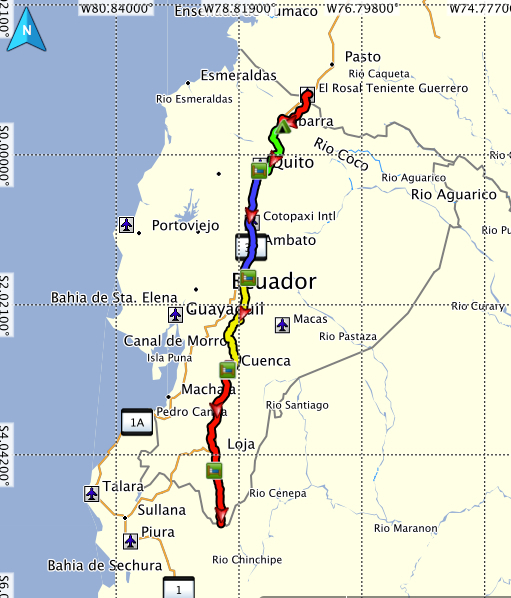 Ecuador track and waypoints as GPX and GDB files. Comment: Clean toilets and hot shower, kitchenette, restaurant, great Wifi, they seem to have also cabins. Comment: Shower head, common TV, Wifi (from congested and no throughput to superfast), free breakfast, kitchen, first two nights in dorm room (10USD/night).